Bashar Al Assad. What is shown by his chart? I noticed that the current transit of Chiron in Pisces is squaring his natal Jupiter in Gemini. Will he just get toppled by the globalist NWO, like the other leaders of countries scheduled for regime change with excuses like weapons of mass destruction? Or will he be tougher and his high intelligence win? His wife Asma was born on 11 August 1975 in London. Mercury square Mars, a very intelligent and highly educated lady. 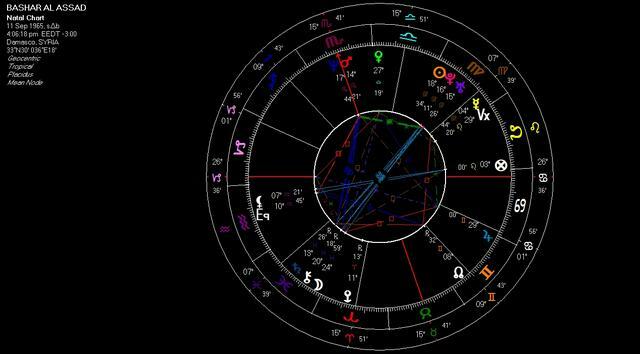 i am hoping this link will give a chart for assad..
here is the thread i did on syria from 2012.. in it, i talk about bashar assads chart some... bashar assads chart is like putins in this regard - they both have pluto rising before the sun... that is an important element to chart reading that often gets overlooked - what is the planet rising before the sun... both these men have shown fortitude in the face of severe challenges.. i attribute that to pluto the first planet rising ahead of the sun.. remember he has been under intense pressure since at least 2011-12 up til now and no sign of it letting up here either..
the jupiter/saturn conjunction in late 2020 as i recall - zero aquarius as memory serves, will be exactly 135 assads natal uranus... that is an interesting trigger, for what i am not sure.. I would be interested why you went for this proposed rectification of Assad's chart. Its obviously an X rated chart on Astrodatabank. Do you have particular reasons for opting for this time? .. the birthdate we have for basher assad is sept 11 1965, but we have no exact time for his birth.. isaac starkman has done a few rectifications, but i am not sure where he is at with these times at this moment. i have from him - 443pm and 1026pm, in that order, so perhaps he favours the 1026pm time more at this moment. .. I have done data research on the charts of lots of dictators and there is usually a strong fixed sign element in the chart. Have you explored a Scorpio rising chart? "Birth time unknown. Starkman rectified to 16.43.24 EEDT Asc 7Aqu22' "
If the Moon was closer to an exact square with Jupiter, within one degree or even up to two, that would be highly significant and maybe worrying from the current transit of Chiron around 29 degrees Pisces. the chart i used is one i had uploaded to postimage back in 2011 or 12.. fleur kindly pointed out to me the source for it - isaac starkman... as i said to fleur in a pm this morning - i no longer would trust or vouch for the time on the chart... when i posted it thursday night - i couldn't recall the basis for it!! as far as fixed sign qualities - i think this chart with aquarius rising, scorpio midheaven would qualify!! now, i have done no work with it, so that is probably all i need to tell you on it's authenticity... actually, i probably did some, but can't recall just what..
scorpio rises beginning at 938am - zero scorpio.. that would put venus close to the ascendant, but out of sign.. moon at 21 pisces - a closer opposition to pluto... the closer opp of moon to pluto makes sense.. of course mars rising makes sense too! he was supposed to be a dentist as memory serves.. that one of his brothers who was supposed to take over from his father died, is why assad was put in the position.. scorpio rising would put capricorn on the 3rd, so a saturn in pisces ruling the 3rd and you inherit a position based on the death of your brother makes sense here too.. again - i will have to brush up on the details of all this, as it has been a while since i considered it. i can't imagine what it would be like to be assad here.. i honestly think he feels he is serving his country to the best of his ability.. is this a byproduct of a sun in virgo opposite saturn in pisces type theme? this is the leader who is confronted with service to others in spite of the obstacles that continually appear from all sorts of piscean currents? does he step aside to allow for some leader who is more receptive to the usa/uk/israel demands here? that seems to be what the west wants... meanwhile the money from saudi arabia/uae/and qatar possibly - continue to pour in for a more fanatical version of islam to take hold in syria - as it has in these countries... at this point the west seems beholden to these financial incentives, more then it does to any humanitarian concern... with so many self interests wanting to tear syria apart, i think syria would be better if these same countries were able to stop meddling in what ought to be a countries own internal affairs..
i know i am getting off the astro here, but how much of this has to do with assad, and how much to do with world leadership circa 2018 is a very open question.. it would seem to me the world is trying to move from unipolar to multipolar world... what happens when empires decline? how did it work with the decline of the british empire and the transfer of power to the usa? how do we move to the next stage on the world today? it seems power likes to hang onto it's power for as long as possible... of course the same can be said for assad here too.. how much of this is based on humanitarian principles as opposed to sheer desire to retain power - is an ongoing and open question..
her leo sun might give slight credence to an aquarius rising ascendant for assad.. i know that i looked at her chart and tried to consider his chart under the light of her planetary positions.. at this point, anything is possible but i do believe a fixed sign in the ascendant is highly likely..
the theme of sun in the 8th house would also revolve around the theme of inheritance, which again - i think is a theme that resonates with assad.. thus an 8th house sun as opposed to an 11th might make more sense..
what is also very interesting is how the cancer planets line up with the saturn/pluto conjunction in 2020... this bears further consideration which i will discuss later.. I sent you my rectified Bashar Chart. Some observations: July 17, 2000 He assumes as President, by Primary Directions MH square to the Sun. 15 Jul 2012 Battle of Damascus, by Primary Directions MH semisquare to Mars. Mars Solar Return conjuncion to the DSC. Today, May 7, 2018, Mars transits the ASC Radix.